2015 is by far the hottest year on record - see my previous article. The year to date average up to and including December is 0.87 °C above the 1951-1980 mean. December was an average of 1.12 °C above the 1951-1980 mean and is the hottest December on record, beating the previous hottest by a whopping 0.34 °C. 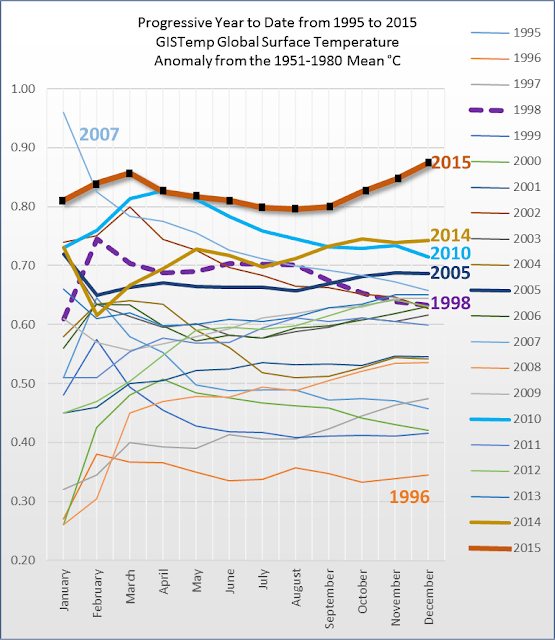 The next hottest was December 2014 (0.78 °C). June, October, November and December this year were the hottest on record for the respective months. The highest anomaly this year is December at 1.12 °C, October was next at 1.06 °C, followed closely by November at 1.05 °C. The lowest anomalies this year so far were April at 0.73 °C, and July also 0.73 °C above the 1951-1980 mean. Gavin Schmidt and Tom Karl said that this year would have been the hottest even without the El Nino. You can read more about the 2015 year on this other article. WUWT totally silent on the subject. Instead something by Worrall about the Davos shindig. What a contrast with the furore about 2014 being "probably not" the warmest year ever. There was a reaction on twitter. It's not the first time Anthony Watts has tried to twist what someone says. It's one of his favourite pastimes. 'Belie' indeed! Good grief! Certain personality types really do like to toss around 'clever' words they don't actually understand, don't they? And what a transparently petty, manipulative misinterpretation of Freedman's original tweet! No-one who wasn't so motivated misunderstood it. The bloody-minded campaign to always cast science exponents/proponents in the most dismal possible light reminds me of Whitlam's observation that if he walked across Lake Burley-Griffin Murdoch's headlines would loudly proclaim 'Gough Fails to Swim!'. * The year to date average up to and including December is 1.12 °C above the 1951-1980 mean. * December was an average of 1.21 °C above the 1951-1980 mean and is the hottest December on record, beating the previous hottest by a whopping 0.34 °C. The next hottest was December 2014 (0.78 °C). Living in Australia (Vic) Sou would have been up all night crunching numbers and preparing graphs. It hasn't warmed since 2000! And and ... it actually cooled from March 2015 to September 2015 until the UHI kicked in again! Sou, you're not doing your mental state any good by your obsession with global warming. You need to consult a psychiatrist this unhealthy obsession before your health suffers too much. Aaw, I dunno, Harry. It's kind of sweet to have a complete stranger so concerned for my mental well-being. I wonder does he care as much about the mental health of climate conspiracy theorists at WUWT, or have I earned a special fond place in his heart? He cares about HotWhopper readers too, not just me. When the lobbyist funding runs dry, maybe. While there is money in climate change denialism, it will keep going.